For this season’s holiday marketing campaign ideas, all you ever need is the Christmas Ball Bluetooth Speaker! Now that we’re almost half way into the fall season, Christmas vibes are slowly starting to fill the air. Soon, you will see shops filled with Christmas displays, decorations and products. A huge Christmas tradition in many countries is setting up a Christmas tree with colourful baubles and candy. These baubles often provide only visual effects, but why not add some joyful noise along with it in this jolly season? Not only does it add colour to the Christmas tree, it adds music to the tree as well! Spice up this holiday season and have your favourite merry tunes blaring all month long with the Christmas Ball Bluetooth Speaker — all while it shines and blends with other ornaments from your Christmas tree. Why we love this Christmas Ball Bluetooth Speaker? Customer Appeal: Christmas baubles are highly popular items during this time of the year. This is why you should grab this chance to attract customers with this unique and multi-functional bauble as your Christmas promo gifts idea. Customizable: Customize them to become uniquely yours — Simply imprint brand logo on your desired colour print and it gives your brand added visibility. Creative Selling Point: Get creative with this bauble. 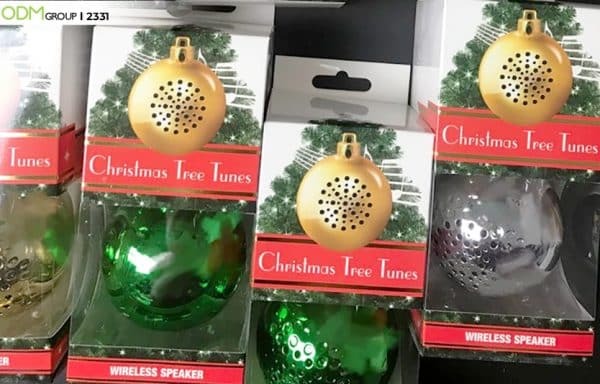 Not limited to the tree, they can be placed around the house as musical decorations. This certainly calls out to even the customers with no Christmas tree at home, who are seeking to add some Christmas vibe to their homes. We have more custom bluetooth speaker ideas in our blog archive that are ideal for Christmas promotions do give them a read. We have written about promotional mini bluetooth speakers before and you may want to check them out for design inspiration. Interested in a custom Christmas Ball Bluetooth Speaker for your customers this season? Send us an inquiry for product code 2331. Here at ODM, we can turn your ideas into reality with our dedicated team of product designers at Mindsparkz. Moreover, with years of experience in product design, sourcing and manufacturing, ODM is able to help you with your marketing budgets effectively. So, make this holiday season special for your customers and have their Christmas trees sing! For Christmas baubles targeting sports lover customers, check out this blog! For Christmas baubles’ design inspirations, have a read! Still looking for even more cool Christmas baubles ideas? This blog’s definitely for you! Read on to find out how a bakery utilized Christmas bauble in their Christmas promotion!